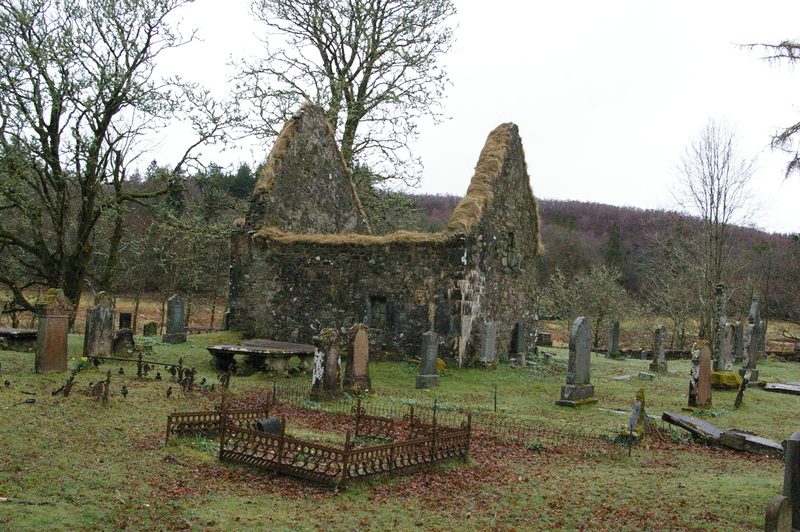 The ancient church of Strathlachlan is now a ruin, but a beautiful one, and well worth a visit to see its remains. The eastern gable is the surviving part of the medieval church. 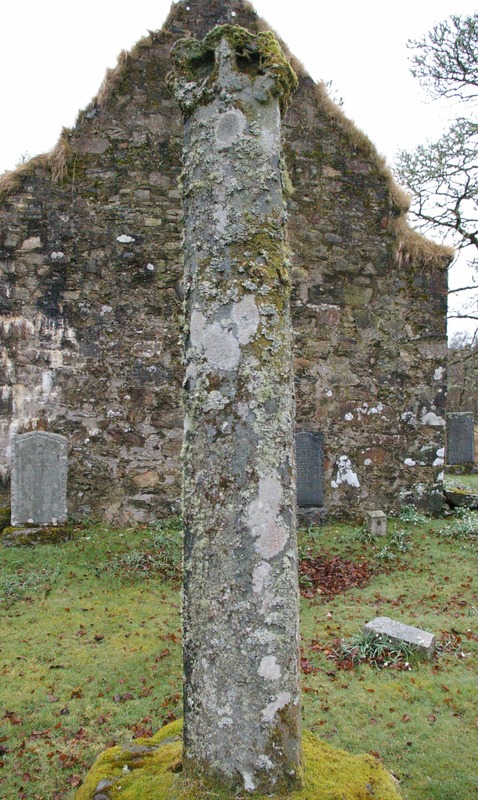 In old documents it is called Kilmorie which appears to be Gaelic cill Moire ‘church of Mary’, though some have suggested that Kilmorie is a corruption of Cill Maelrubhai ‘church of St Maelrubha’. While the latter is possible, local tradition in the eighteenth century was that St Mary was the dedicatee, and local pronunciation of the name also suggests that Mary was the saint commemorated here. There is a well at the roadside, a two minute walk from the church, called Tobar Cill Moire, ‘the well of Mary’s Church’. 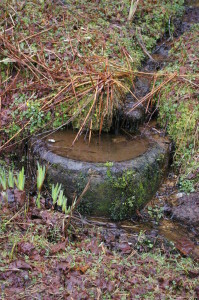 Isobella Cameron (1909-1983) of this parish recorded that it was once known as a ‘holy’ or ‘wishing’ well, suggesting that it was used in popular devotions. No written record of the church survives before 1543, but it was probably a good deal older than that. It lies close to the ruins of old Castle Lachlan, the seat of the Maclachlan family who ruled this district in the middle ages and later, and who gave their name to the area – Strathlachlan. The proximity of castle and church is eloquent testimony to the the relationship between the clan chief and the priests (and later the ministers) of the church. The close tie between Clan Lachlan and Kilmorie continues today, since the old church has become the family mausoleum for the Maclachlans. The late chief – 24th of that line – was Marjorie (‘Marnie’) Maclachlan, who died in 1996 and is buried by the door of the mausoleum, close to the remains of her ancestors. Her husband (George Stiles Rome, who took her name but not the chieftainship of Clan Lachlan) is buried on the opposite side, having died two years before her. Kilmorie was abandoned when a new church was built circa 1792 on the roadside almost a mile to the north-east (NS021958). This is still the parish church of Strathlachlan. It is not normally open except for services on Sunday mornings. 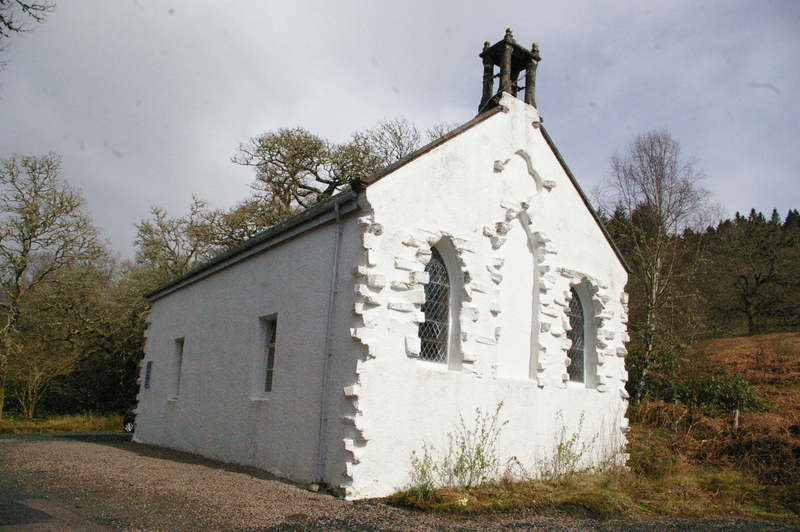 The modern church of Strathlachlan replaced the one at Kilmorie in the eighteenth century. In the churchyard of Kilmorie, close to the eastern gable, stands a tall medieval stone cross – not necessarily in its original position. Though the top of its head has been broken off, its octagonal shaft and the lower part of its head remain. Another piece of this cross is now kept for safekeeping in Strathlachlan church. The ‘well’, Tobar Cille Moire, is a roadside basin, fed by a burn. There are no remains of its former use as a holy well. The basin does not seem to be ancient. A hand plunged into it to see if any tokens had been left there (coins, quartz pebbles or the like) came out holding nothing but the mud which the burn had carried into it off the hillside. Nevertheless, we should recall Isobella Cameron’s observation that it was known as a ‘holy’ or ‘wishing’ well. There is an important five-year conservation project underway at Old Castle Lachlan and Kilmorie, and though much work has already been done at the church and the castle, as well as improving access along the shore, there is a lot more to do. The Lachlan Trust is responsible for this work, and is seeking support for its development. Getting here: click on ‘View Larger Map’ below for a good OS map of the area, including road access.